Select number of guests 12345678910111213 ? Lake Garda is the largest lake in Italy. 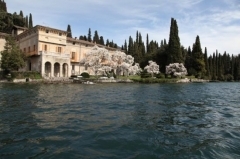 It is located in Northern Italy, about half-way between Brescia and Verona, and between Venice and Milan. Glaciers formed this alpine region at the end of the last Ice Age. The lake and its shoreline are divided between the provinces of Verona (to the southeast), Brescia (southwest), and Trentino (north). Being easily accessible from the north via the Brenner Pass, the lake is a major tourist destination.